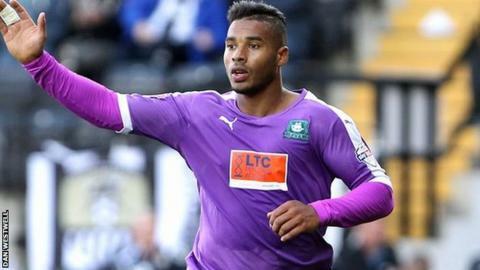 Plymouth Argyle should have Reuben Reid, Peter Hartley and Luke McCormick fit again by the start of December. Reid, the club's top scorer for the last two years, has not played since 17 October after suffering a hip injury. Hartley has missed the last two games with a hamstring injury, while goalkeeper McCormick has missed the last three matches. Argyle brought in Brighton's Christian Walton and Crystal Palace defender Luke Croll in on loan as cover for the duo. The Pilgrims travel to Dagenham & Redbridge on Saturday, before a weekend off ahead of Cambridge United's visit on 12 December. "They're all progressing well, but it's highly unlikely that they'll be available for Saturday," manager Derek Adams told BBC Radio Devon. "I'm hopeful when we have the break next week that we can have a fully-fit squad going into the Cambridge match. "We'll have played 25 games and, with a small squad, it's been hard. "The amount of travelling we have to do takes it out of you mentally as well as physically and it's important you do get a break to relax and train and not have the pressure of playing on a Saturday all the time."